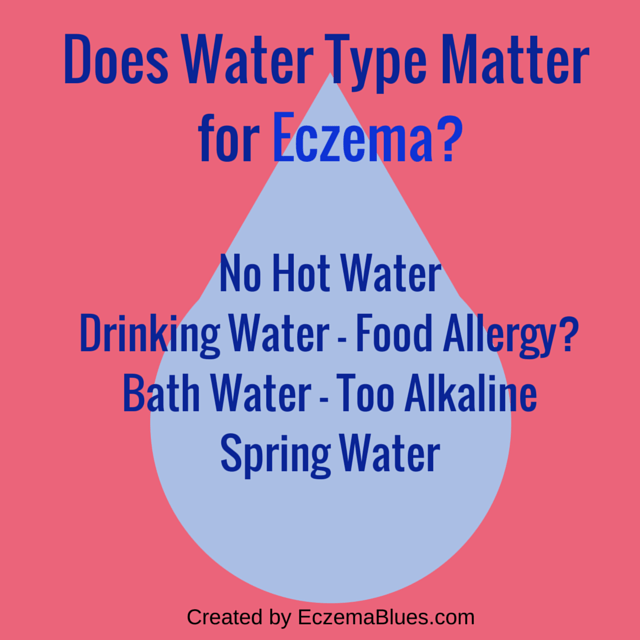 Posted byMei 29 April, 2015 27 October, 2016 2 Comments on Eczema ‘Cure’ Series – Does the type of Water Matter? Hot water strips moisture from the skin and it is never recommended by dermatologists. It may feel good because the heat temporarily numbs the (itch) nerves and so a hot shower offer temporarily relief – avoid at all costs. Consider other bath options that are more beneficial for eczema, dry skin and relief such as a cool compress. Does the Water Type Matter? Updated on 27 Oct 2016 – For those of you wondering about the benefits of alkaline water, interesting read on MedicalNewsToday – no benefit and even showed harm! Bathing water – Too Alkaline – Tap water is alkaline with an average pH value of 8. As the skin pH is slightly acidic, washing with alkaline contribute to skin dryness. Thus, another reason to limit your shower time. Read more from dermatologist Dr Cheryl Lee on vinegar bath increases the acidity of the bath water. Hard water vs soft water – Hard water is caused by limestone (calcium carbonate) dissolving in the water and it is the white deposit that is seen in kettles, bath tubs and steamer. Hard water has been associated with higher incidences of eczema and identified as environmental trigger. However, in a randomized-controlled trial, there was no significant difference in families whose eczema children use hard water versus soft water (via a water softener). However, many eczema sufferers personally feel better about using soft water, partly due to lower pH level and less detergent needed in soft water washing. Spring water – A well-known spring water spa for eczema sufferers is La Roche-Pasay in France. It’s possible that a higher selenium content or the presence of a certain bacteria (Vitreoscilla filiformis) in spring water is beneficial for dry skin. The important thing is to moisturize immediately after a shower – this one step outweigh the type of water you use or even what you use to shower with (no soap). Immediately moisturizing traps moisture on the skin and limits the evaporation of moisture from the skin after bath. Leave some moisture on the skin, don’t rub very dry and trap some of that with an emollient cream/ointment right after bath. Mom NeedyZz Cartoon – Is Switching to Formula Milk a Boon or Bane? 2. We recommend use of a soap substitute (essentially an emollient) on the skin before contact with water too. Water needs to be seen as a problem for atopic skin – it needs some protection as the skin barrier function is deficient and needs a little regular help! Lovely to be in touch with you. Thanks Dr B – I can’t help but be open-minded as parents are always anxious to find out more beyond what the docs say. It’s better to tackle these rather than sweep under the carpet. Love your points on soap substitute – I hear so much about it from a dermatology nurse who used to work in the UK but I haven’t figured out how to do it! To me, it feels kind of slimy to coat an emollient before water contact but I know it’s being practised and ‘dermatologically’ sound, thanks!